The Natural Park of the Ligurian Alps is located in the western part of Liguria, in the Province of Imperia, between the French border and Piedmont. The Val Nervia, with the Rocchetta Nervina and Pigna communes reachable from the Ventimiglia-Bordighera area, is the closest to the sea and extends between cultivated floriculture, olive groves and vineyards that further north goes into chestnut and beech woods. The Alta Valle Argentina, with the municipality of Triora, gravitating from Arma di Taggia, has steep altitudes, wild naturalistic scenery and inhabited centers on crests or rocky spurs. More wild is the Alto Valle Arroscia, with the municipalities of Rezzo, Montegrosso Pian Latte, Mendatica and Cosio d’Arroscia, reached from Imperia and it is the area with a more distinctive mountain vocation, characterized by extensive pastures and extensive woods. Through paths, secondary and unpaved roads, you can move from one valley to the other of the Park using ancient ridges that have been restored today, offering magnificent 360 ° panoramas on the Ligurian Alps and the sea. 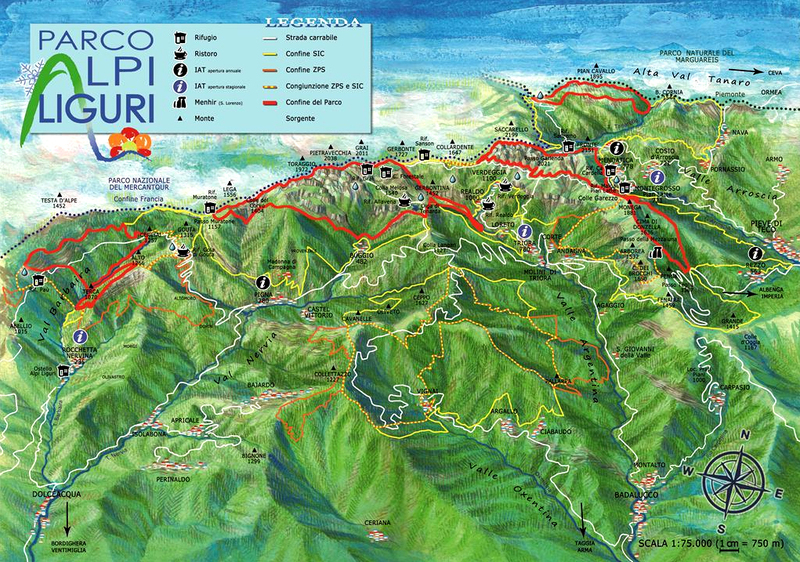 Some 2,000 meters of altitude difference separates the areas downstream from those upstream of the protected area: the highest altitude is reached at the summit of Monte Saccarello, which with its 2,200 meters is also the highest peak of the entire Liguria.